Southwest Kansas has seen some good hatches, and “Wild West Country” had one of the best last year. We explore Horsethief Reservoir’s pheasant habitat with shotgun world record holder Dave Miller of CZ-USA, get a look at a new CZ shotgun, and learn a lot about shooting and wild ringnecks. 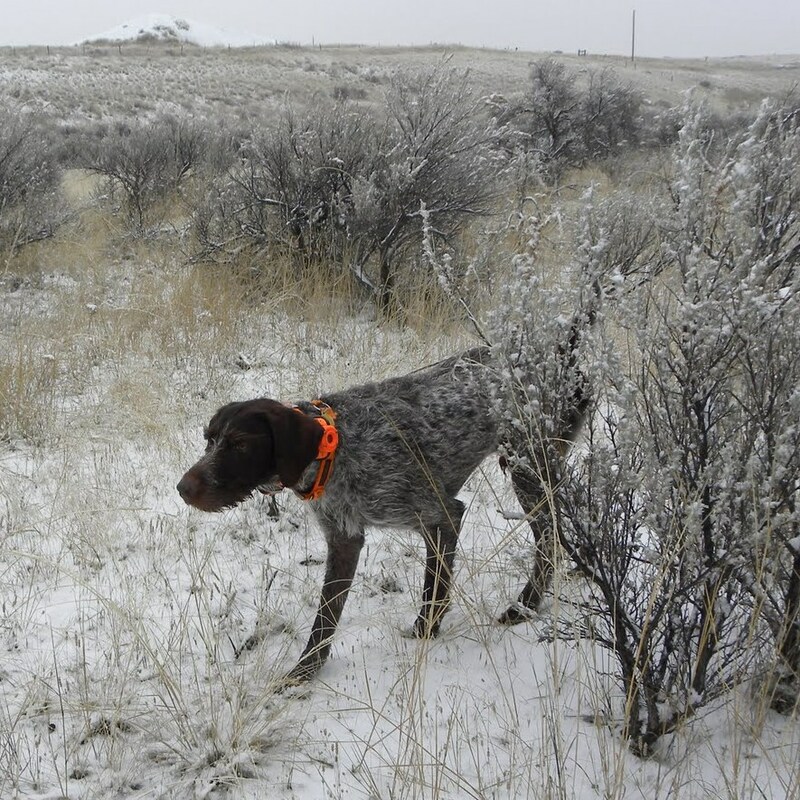 Learn more about dog training, public-land access, win a hunting trip to Ruggs Ranch, get shooting tips and wild-game cooking advice too! Pursuit is available on Dish Network Ch. 393 and DirecTV Ch. 604, and a ton of other streaming, FIOS and other set-top and online devices. Beeper, bell, brush … it may not be disobedience as much as noise! Next time your dog disobeys you, don’t jump to the inevitable conclusion. It may not be recalcitrance. He may not be stubborn. There’s a chance he’s not disobeying. Did you ever think he may not be able to hear your commands? When I attached a video camera to one of my dogs, it was clear from the playback that there are vision challenges when looking to a tall human for direction. Thanks to the microphone on that camera, I’ve learned that it’s an audio circus down there, too. Depending on who you believe, dogs hear up to ten times better than us. So, many of the annoying little pops and crackles we hear sound like a freeway accident to him. Think about what he encounters down there: tags jingling from his collar, or a bell, brush crashing, screeching wind, footfalls on dry leaves, maybe a beeper collar right behind his ears, his own panting. All might be overpowering your frantic commands yelled into that auditory chaos. Or, your Lab’s ears might be hammered by a flock of Canada geese honking, or the churn of moving water as he looks to you for a line. Maybe there’s another whining dog in the blind, or at a hunt test there could be dozens of barking dogs staked out nearby. It’s no wonder dogs bungle their job once in a while … they can’t hear our commands for all the chaos at ground level. If there’s doubt in your mind about whether your dog can hear you, why not add hand signals or a whistle just in case? Or, call his name and wait for acknowledgement before giving the command. 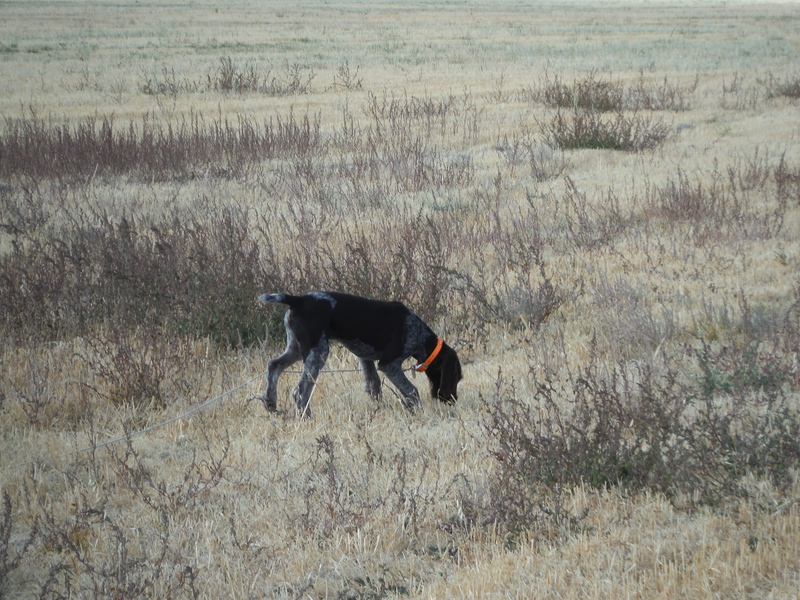 Then you’ll be able to recognize the difference between disobedience and distraction, and he’ll be a better hunting partner. So, maybe you’ve had the same problem. Often, we blame it on “planted” birds, and that much is true. 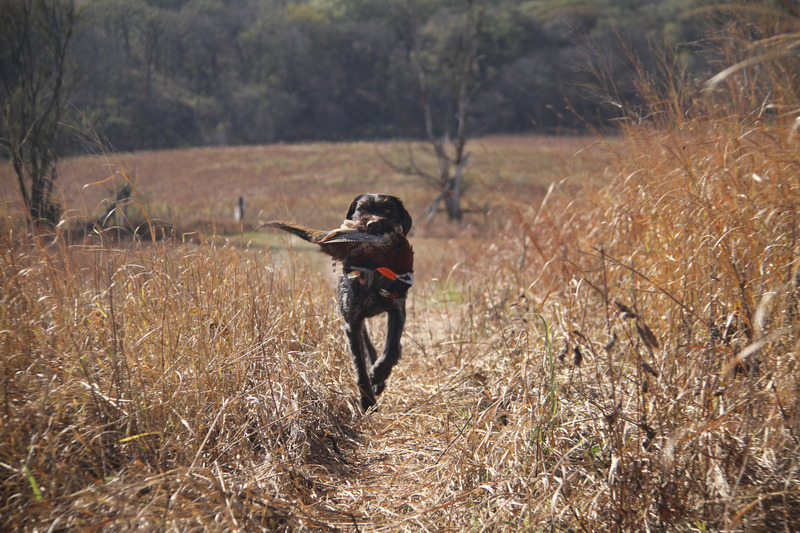 But if your goal is a dog that stands a bird from a distance the moment it hits the scent cone, you can train it with “planted” birds. There are at least two critical considerations: sight, and timing. Timing: The advantage (usually) to wild birds is they will not hang around waiting for a young dog to slide in, relocate, nose around, get closer. They will flush. Hopefully, the dog learns from it. That’s the joy of wild birds, but if you don’t have them, what can you do? Don’t we all wish we could open the gate and find wild practice birds all year? That, or winning lottery numbers – I’ll take either one. So save up your cans and bottles (or quit drinking so much!) Buy a remote launcher – or borrow your club’s launcher (you are a member of the local NSTRA/NAVHDA/NAHRA chapter, right?). A dog that cheats the scent cone just to watch a wild bobwhite fly off can learn the same thing with a pigeon: get too close and the bird goes away. No passing go, no collecting $200. And certainly no retrieve. The trainer needs to be ruthless, and willing to throw away a few birds. 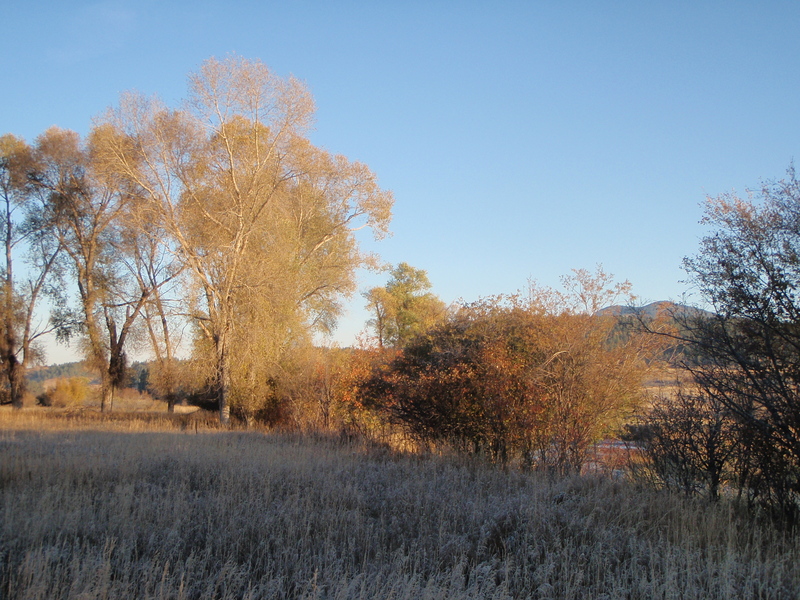 But simulating the uncompromising behavior of wild birds is possible, and the rewards are life-long. Now, the other end of the equation: sight. If you didn’t buy a launcher and are simply hard-planting birds or using a harness, you’ve got another challenge. 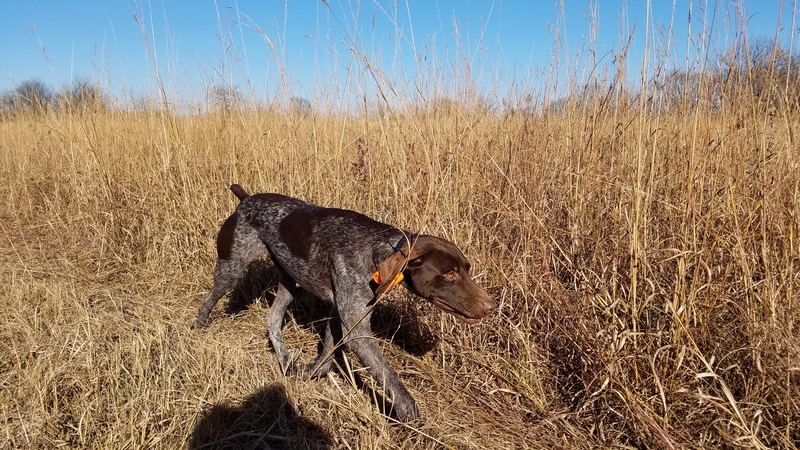 Birds won’t flush “wild,” so a dog can creep in when he hits scent, ultimately getting within inches of the restrained bird, if not actually picking it up. Higgins Gun Dogs got me thinking about this. He uses the “Magic Brush Pile,” but as far as I can tell, in slightly different ways. It works, and more power to him. My brush pile’s “magic” is making the launcher or bird harness invisible. My dogs, trained without a launcher, quickly learned to hit the scent cone then search for the bird. When they saw it, they would point. Worse yet, sometimes they would simply go in and catch the bird. Flick seldom sees a remote launcher, except on a shelf in the shop. They are now well hidden among the sage and bitterbrush so the only clue that there is a bird nearby is the scent. A well bred dog, brought into the scent cone from a 90-degree angle, will be startled into an immediate point. A tug on the check cord will help. A strong breeze doesn’t hurt either. Enhancing your success with bottled scent does too. Put the bird/launcher out sooner, let that scent “marinate” and build up a goodly cloud in a wide downwind arc. Check-cord the novice into that scent cone and voila! Hit the launcher remote, and boom, you’ve got a “wild” bird scenario. … as long as the “old dog” is a human. Even at 18 months old, he’s still a puppy. There’s more than one way to skin a cat (figuratively, of course). As to #1: I’ve hunted with a goodly number of women dog handlers, some highly respected to the point where they judged European gun dog tests. They and their protege’s had one characteristic in common: they were the most upbeat, positive, encouraging handlers I’ve shared a field with. 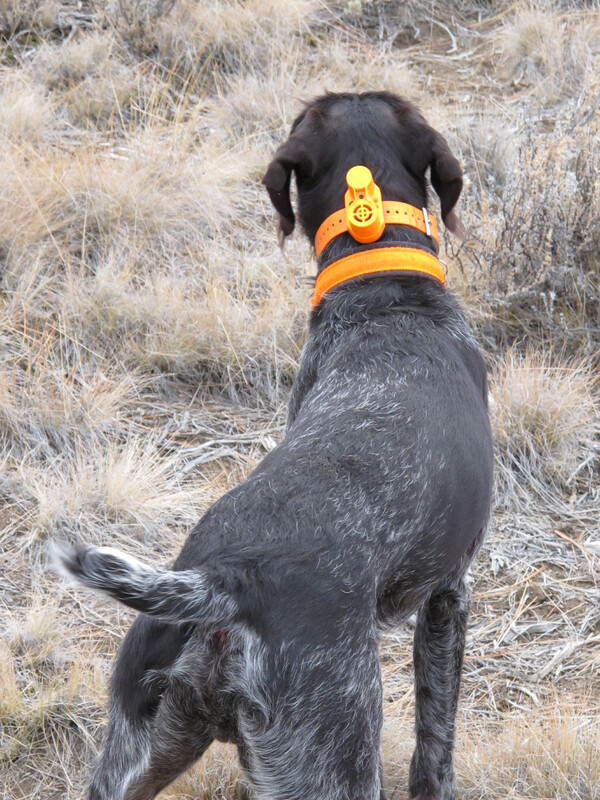 Squeaky mommy voices, clapping hands, over-the-top praise all melded to motivate and mold incredible gun dogs. Working Flick a few weeks ago, a few of those actions fell into my own routine and boy howdy what a difference. Which also reminded me of some reading years ago that strongly suggested the only reason humans could domesticate wolves was by arresting their development at the puppy stage. Related to that, is #2, especially when applied to “force breaking.” If you watch the TV show, you know what a rock star Manny was in this department. On land, water, blind and marked I’d put him up against any field-trial Lab. I had help from his breeder on him, and mainly used the traditional ear-pinch method. Flick’s matriculation to retrieving is different. He’s a lot softer dog, so the risks of using pain are very real. More importantly, he probably doesn’t need it. Think about it: we use pain to get a dog to howl and open his mouth so we can jam a bumper in. If we can get the mouth open with painless methods, why not try it? With this guy, it was as simple as an index finger between his teeth while giving the “fetch” command. Following on, the usual techniques seem to work: move the held bumper, move him to it, on to the ground, etc. Sure, he disobeys at times. We go back a few steps, put the finger in the mouth and work through it. Once he truly understands what “fetch” means, it’s about reinforcing – and rewarding – obedience to that command. And yes, high-value food treats work (I know some of you will cringe at that, but it works for us). Hot dog bits and chicken skin are the go-to positive reinforcers in my yard. Yeah, the jury is still out. But as best I can tell, Flick is as far along or farther than most dogs training with the other methods. I’ll keep you posted, and appreciate your feedback.